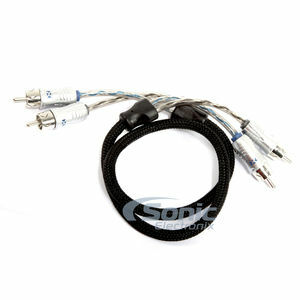 Add a pair of NVX XIX205 Premium 2-Channel RCA Interconnects for only $6.00. Simply click the "Add Both to Cart" button. This offer cannot be combined with any other coupons or offers. 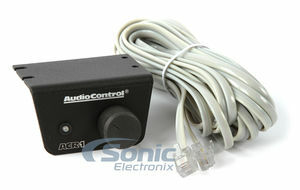 Take control of your Bass with the optional ACR-1 Remote that allows for user control of the Subwoofer level. For over two decades, AudioControl has been designing and manufacturing award-winning autosound products at our factory located in the rainforests of the Pacific Northwest. During this period, countless sound-off winning contestants have chosen AudioControl products to give them the competitive edge. "Can you really win without AudioControl", was part of an article written commenting on competition winning systems. Nothing sounds better than an awesome recording played back on a kickbutt system. Unfortunately, the acoustics of your vehicle can take away from your systems performance. While AudioControl products do not change the laws of physics (although they act like they do), autosound enthusiasts have long known that AudioControl products "make good stereo sound better". High performance car audio amplifiers love lots of signal voltage. This allows them to deliver optimum sound quality and maximum bass response. Unfortunately, many of today's after market source units don't output the optimum voltage levels these amplifier need. 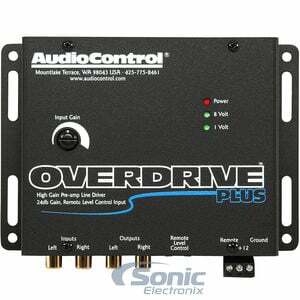 The AudioControl OVERDRIVE PLUS pre-amp line driver increases the line level signals from aftermarket source units up to 13 volts max (9.5 RMS) and delivers them downstream to the amplifiers inputs. The results are increased dynamic range, maximum signal-to-noise levels, and tremendous bass response. 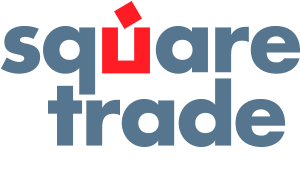 Autosound enthusiasts will enjoy dramatically improved sound quality of their after market audio system. 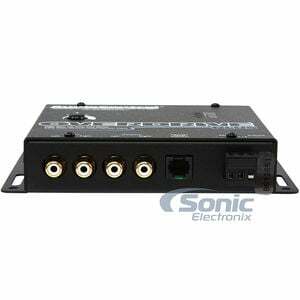 The OVERDRIVE PLUS features an optional dash control input which facilitates remote control of pre-amp signal levels. 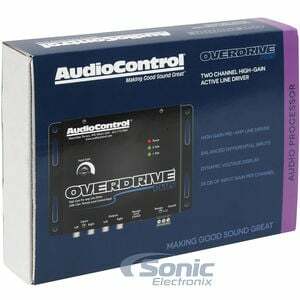 This makes the OVERDRIVE PLUS ideal an a controller for overall system master volume or subwoofer levels. The OVERDRIVE PLUS is a line driver that takes the input voltage of a high performance source unit and increases it (up to 13 volts peak). It then delivers this punched up signal to the amplifier for more lifelike sound with less noise, less distortion and more dynamic range. In short: it makes music played on your system sound more like live music. This means the OVERDRIVE PLUS can dramatically increase the pre-amp signal level from your source unit and deliver it downstream to the amplifiers. Higher signal voltage means maximum output, sonic clarity, and the ability to drive multiple amplifiers! Driving long lengths of cable can present a nasty capacitive load to the source that has to drive them. The OVERDRIVE PLUS' low-impedance, high-current output circuitry can easily handle long cable runs without their associated problems. The available signal boost or cut for each of the frequency bands. The maximum level (in volts) of signal output. A higher level will increase the clarity and boost your signal. This is the total number of input connections that go into the unit. This is the total number of output connections that the unit will produce. I purchased unit before and it lasted about 4 yrs. I am impressed by it performance and that is why I got a new one. It make a big difference in your music. Yes, i would recommend this product to someone to buy.